Award-winning author and historian Trudy E. Bell presented on “The Great Telescope Race and the Warner and Swasey Company” Friday, February 17 as part of a Burrell Memorial Observatory open house. Bell is the former editor for Scientific American and IEEE Spectrum, and currently holds the position of senior writer for the University of California High-Performance AstroCom-puting Center. She has published over 500 articles in national, regional, and specialized publications, and has authored, co-authored, or edited a dozen books. Bell holds a master’s degree in history of science from New York University and a bachelor’s in history, with a physics minor from the University of California at Santa Cruz. Warner and Swasey, builders of some of the largest refracting telescopes of their time, also affected the Cleveland area, especially the designs of telescopes at Case Western Reserve University and Baldwin-Wallace College. Though they originally started their business in Chicago, Warner and Swasey realized they needed to move farther east, toward the location of their company. They moved to Cleveland, and at the high point of their business the company employed 6,200 people. The buildings at East 55th Street and Carnegie Avenue are still standing, though empty now. “They also believed in giving back to Cleveland,” Bell said. The Warner and Swasey Observatory at Case started with the donation of a 9 1/2 inch refracting telescope that was originally Warner and Swasey’s private telescope that stood behind their adjacent Cleveland residences. The Burrell Memorial Observatory on B-W’s North Quad was donated by the wife of Dr. Edward P. Burrell, a 37-year engineer at the Warner and Swasey Company. 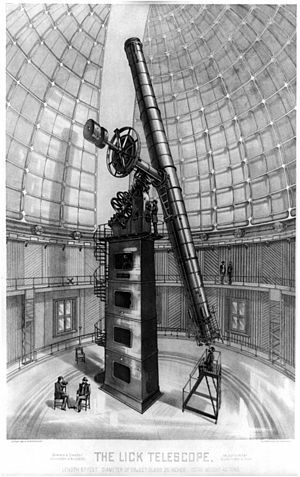 The telescope is a “typical Warner and Swasey,” as Bell calls it: a 13 3/8 inch refracting telescope with their signature tapered rectangular mount. It is one of the biggest in the area, with the next telescope only coming in at 10 1/2 inches at the Cleveland Museum of Natural History’s Ralph Mueller Observatory. This was Bell’s second time at B-W, the first in 2001 with the Antique Telescope Society. “I saw an article in Sky and Telescope magazine, then looked at the byline and saw she was from Cleveland. I thought it would be a great opportunity for an open house,” said Gary Kader, astronomy professor and the man in charge of the open house. A native of Washington State, Bell currently reside in Lakewood. Upon her departure, Bell left these words of advice for students at Baldwin-Wallace College: “Think creatively about what you want to end up doing. Don’t slot yourself so narrowly. Don’t underestimate the value of having interesting ideas.” She speaks from personal experience. Bell began as a physics major in order to become an astronomer, but became more interested in history while working at the Lick Observatory in California, and now works not as an astronomer, but as a science writer. Following the talk, the observatory was open to the public if only to see the famous telescope, since a layer of cloud cover had moved in, making the night sky difficult to see.